The Power of Five is a young adult series of books by author Anthony Horowitz. 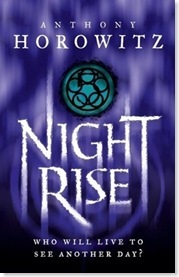 Don't be put off by the 'young adult' status though; this series is fast-paced, inventive and highly imaginative. Read it! 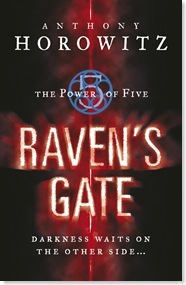 The fourth book in The Power of Five series is only being released on 30 October 2008. That is 25 sleeps away! Raven's Gate is mostly set in the fictional town of Lesser Malling in England. I remember this because my husband tried to get me to move to a town called Malling in Kent and after reading this book there was no way I was moving there! You're introduced to the hero of the series, Matt, as he finds himself in trouble with the law and he is sent to live with a strange foster parent in Lesser Malling. Matt comes to realise that a great evil is under way in the town and that it is up to him to stop it. The book is extremely fast-paced with non-stop action as Matt overcomes hurdle after hurdle in his quest to stay alive and fight against the weird town folk of Lesser Malling. There were times when my heart was literally jumping out of my chest and you have to marvel at Horowitz's ability to make your adrenaline flow - this is a book after all, not a film! 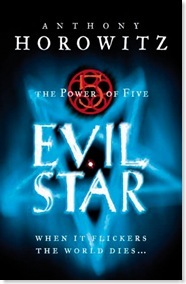 Evil Star starts off mere weeks after Raven's Gate ended. Matt is the protagonist yet again and you follow him on a journey to Peru as he tries to stop the opening of the second gate. The book is steeped in Incan mythology and yet again the story is extremely fast moving and highly imaginative. While Raven's Gate was set entirely in England, the foreign and exotic setting of Evil Star is really interesting. The idea that the ancient Incans still walk the Earth is fantastic. I wish I could say more but I am trying to rein myself in and not give away spoilers. The book is a real page turner and you are introduced to the second of the Five, a young Incan boy called Pedro. The third book in The Power of Five series is set during the events of the previous two books. This time, you meet two more of The Five - twins Scott and Jamie Tyler. Scott is kidnapped by the evil Nightrise Corporation and the story follows Jamie on his journey to try and rescue his brother. Once again, the pace is fast and Horowitz's imagination knows no bounds. I was simply unable to put this book down and while I enjoyed the previous two books, I feel that Horowitz is really coming into his own with this offering. The book takes you into the ancient world of the Old Ones and to a battle that was fought tens of thousands of years ago. It really begins to tie the whole series together and I honestly cannot wait until I can buy the next book on 30 October.